As promised, here’s the next part of How I Write My Novels. If you missed part 1, click here! There’s no other way to say it, I love this part more than any other! With all of the pre-writing done, I pick up my laptop, go to my favorite Starbucks, and I start writing from the very beginning. Usually what happens is I have two windows up, one with my transcribed plot progression (not sure if synopsis is quite the right word) and the other is which ever chapter I am working on at the time. As I go along, if I need a reminder about where I am taking the story or characters in that chapter, I look back at the other window, and then I continue writing. This is also the part when I get to know my characters the best. All of the little nuances, all of the reactions, the emotions, this is when they come out, as I write the story. I find that I can’t really plan these too well, because then they come out feeling artificial. They just happen! When the characters move me and drive me, that is when my best work is done. I also discovered in The Sword of Dragons book 2 that my chapter outlines are not hard and fast rules. If I have ideas to change or add things in as I go along, I do not hesitate, because when I do this, it’s usually my unconscious mind saying “this is boring, but do it this way instead, and it’ll be better!” For instance, book 2 was originally supposed to be 36 chapters (not counting the prologue and epilogue) but when I finished writing, it ended up with 4 additional unplanned chapters! 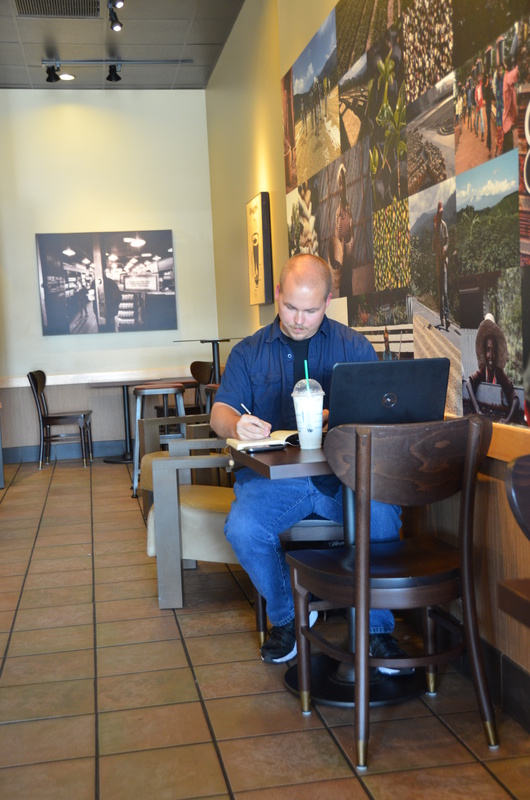 Since I’m not yet living off of writing (although that has become my goal), I can’t do this every single day, so I usually end up going to Starbucks every Saturday or Sunday (or sometimes both) and I spend at least 4 hours there writing. This usually lets me get at least 2 chapters done, depending on their length, but when I’m on a roll and the writing takes on a life of its own, I can write upwards of six chapters! That is because it interrupts the flow of storytelling. Not everyone might experience that or agree with me on this, but I strongly advise against stopping to proofread every chapter. 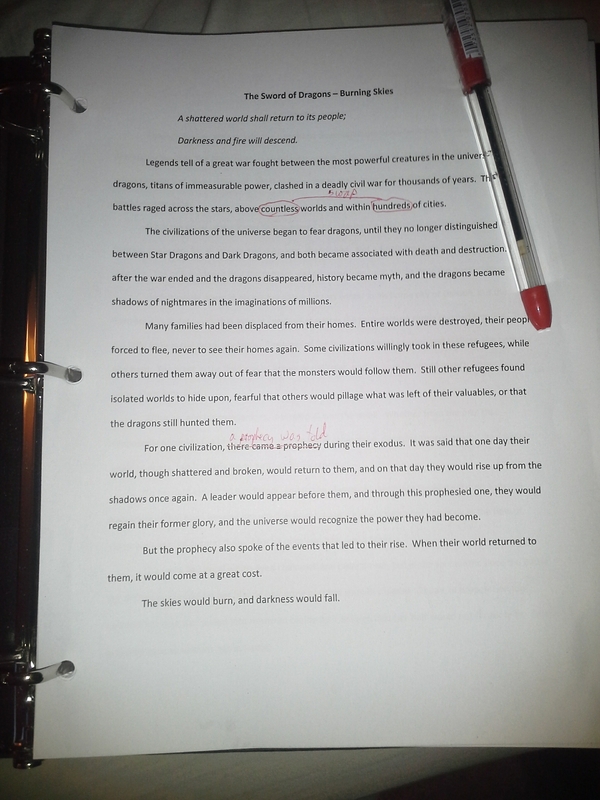 Once the first draft is complete, I’ll usually let it sit for at least a few days while I allow the high of completing a full novel to wear off :) My first proofread is done on the electronic version, on my laptop or desktop PC. I don’t actually do this right away, once I finish my first proofread (which I seem to do in a couple of days) I let the novel sit for at least a couple of weeks. This gives me some distance from the story and characters, so that I can come at it with a fresh perspective. When I’m ready for round two, I print it out, and I read it with a red pen in hand. That red pen also acts as my bookmark, because I find reading the hard-copy takes me a lot longer. I don’t know why I go slower, but it also means I catch a lot of things I didn’t catch before. I also write in notes for any additional paragraphs or sentences or scenes I want to add. Some of the pages look pretty red by the time I’m done with them! I can’t stress this enough to all writers: don’t be afraid to make big changes to your manuscript during your proofreads! If your mind is saying something doesn’t work, trust your instinct! The final parts are pretty cool, in that I get to have eyes-on it from others. While I saved this part for last, beta reading can be done at any time after completion of the manuscript. For book 1, I let friends read it only after it was a polished product. For book 2, I sent the chapters to my friends as I finished them, and then sent revisions during the 1st proofread. (I’m still working on proofread #2). Thank you to my friends Nick and Natalie for being my beta readers for two novels now. You two are awesome!! Be warned: your beta readers might have things to say that you don’t want to hear. But remember that they don’t know the story inside and out like you do, and if they say something seems wrong or is off or is confusing, so will almost every other reader out there. Heed their feedback!! When all is said and done, I usually do one more hard-copy proofread, and inevitably find more typos, grammar errors, etc. Since I don’t have an editor, this is the part when the manuscript is fairly polished, and is ready for query letters to be sent out. Thanks for reading, I hope you enjoyed these articles!